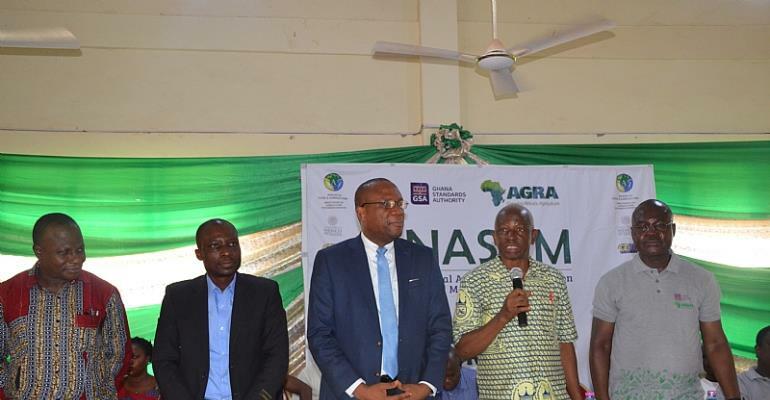 The Ghana Standards Authority (GSA), together with its partners, has launched the National Aflatoxin Sensitisation and Management (NASAM) Project at the University of Development Studies (UDS), Navrongo Campus in the Upper East Region. The NASAM is a two-year nationwide project being implemented by the GSA with funding from the Alliance for Green Revolution in Africa (AGRA). The project aims at catalyzing and sustaining an inclusive agricultural transformation by improving food safety and security through increased knowledge about aflatoxin, its impacts and management. The launch, which was held on Monday, April 8, was attended by over 400 participants, made up of agricultural officers, students, researchers, staff of GSA, partners, value actors and over 6 farmer-based organisations on maize, groundnut, poultry, millet, among others. In his keynote address, the Director-General of the GSA Professor Alex Dodoo, called on Ghanaians especially farmers to embrace and support the project to ensure food safety, security and to boost both local and international trade. “So my only plea is that let us look at this as not just a project coming from a donor but something that we need to do for ourselves, for our local economy or for our country but importantly to ensure Ghana becomes the best place to do business,” he said. “We will listen to you to help you to apply the techniques which we believe will help you,” he told the participants. The Principal of the Navrongo campus of UDS Professor Albert Luguterah thanked the GSA and its partners for launching the project and engaging participants in the Navrongo and elsewhere, which he said will go a long way to help the community overcome the effects aflatoxin. He was hopeful that the project will provide the community particularly farmer-based organisations the needed information to be able to address the effects of aflatoxin. The Municipal Chief Executive (MCE) for the newly-created Bolga East Assembly Professor Emmanuel Bole, who represented the Regional Minister, thanked the GSA for the bold step in ensuring food safety and security in the country, pledging his full support to make the dream of aflatoxin reduction a reality. Aflatoxins are secondary metabolites (chemicals) from fungus or moulds specifically Aspergillus flavus and Aspergillus parasiticus. These moulds occur during pre-harvest or post-harvest on commodities such as maize, groundnut, agushie, cocoa dried fruits, treenuts and their derived products, infesting them with aflatoxins. Aflatoxins are cancinogenic, meaning they cause cancer mainly to the liver and are also responsible for stunted growth in children while in high doses, they cause Aflatoxicosis which can lead to death. Generally, Aflatoxin contamination can occur at both pre and post-harvest stages of food production. Poor agricultural practices during planting, insect damage, drought, harvesting, drying, transportation and storage are pre-disposing factors. National Steering Committee on Aflatoxin Control (NSCAC), Food and Drugs Authority (FDA), Ministry of Food & Agriculture, University of Development Studies, International Institute of Tropical Agriculture, Mexican Embassy in Ghana, Farm Radio International, Nestle and the Ghana Journalists’ Association (GJA). The Navrongo launch will be followed by workshops in the Wa on April 10 and at the Nyankpala campus of UDS on April 11. The Workshops and demonstrations will target farmers and actors in the maize, groundnut and sorghum value chain. GSA is the National Standards as well as Conformity Assessment body. It is responsible for developing, publishing and promoting standards. The Authority derives its mandate from the Standards decree, NRCD 173 of 1973, as well as the Weights and Measures decree 326 of 1975, which makes GSA custodians of weights and measures in the country.